I get a lot of weird PR requests that I ignore, mostly because even though they all say they love my blog they then offer me spicy or alcoholic stuff – both of which indicate they do not read this blog since I frequently mention being allergic to hot spices and being a teetotaller. 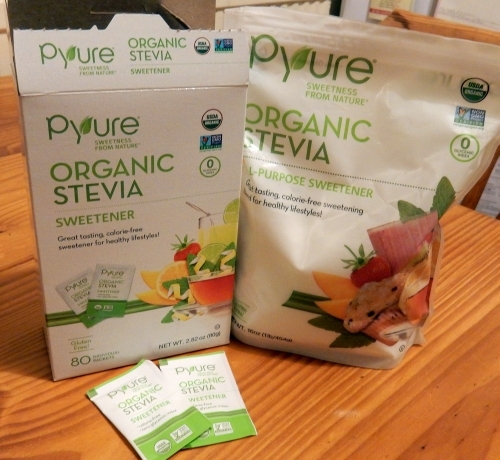 But a PR firm recently asked if I’d be willing to taste test some Pyure Organic Stevia, both in individual 1g packet form and a 454g bag. I said I’d be happy to since I’m diabetic and had never tried Stevia before, though I’d been meaning to, but that I was in the UK for a year. So I was surprised when they replied that they’d be happy to mail me some all the way over here. I received these products free from a PR firm but no other payment or consideration, nor was I obligated to give a positive review. All other ingredients used in this post were fully purchased by me with no other corporate sponsorship or involvement. I have been using Splenda (the Granulated kind that is puffed up so it measures like sugar) for years. I know that it’s not good in cookies where the hygroscopic nature of sugar is required. Frankly, Splenda cookies are like hockey pucks or dwarf bread, depending on how nerdy you are. But I use it all the time as a complete sugar replacement in my regular oatmeal pancakes, and I routinely sprinkle it on puffed wheat cereal that has no other ingredients. I also use it for hot chocolate by mixing it with cocoa powder and milk and really enjoy that as a warming treat on a cold day. When I received the Stevia, I tried sprinkling some from a packet on the puffed wheat cereal and was not keen on it. I found that it had a metallic aftertaste that I did not like. Splenda often has an aftertaste as well, but not so much on the puffed wheat because I use so little of it (the milk in the bottom of the bowl definitely has the aftertaste). With the Stevia, if I used enough to get the same level of mild sweet, the aftertaste was a bit too strong. I decided I should put Stevia to a baking test, especially since Splenda can be hit-or-miss in baked goods. 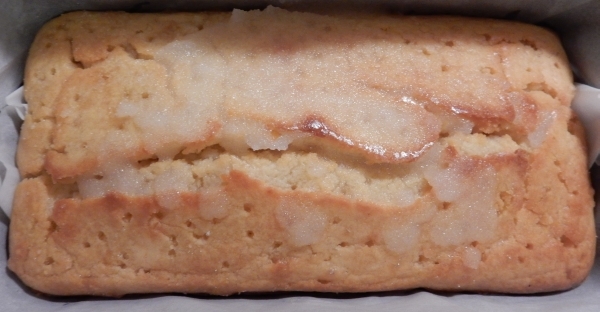 I had recently made a lemon cake using this recipe from Food.com, but as usual with other people’s recipes I’d cut the sugar substantially. In that case I left the sugar amount for the glaze but cut the 1 cup in the cake itself down to 1/2 cup. The light colour of the cake would highlight any browning differences really well. The cake forms a nice crust with sugar, so I’d be able to compare if the substitutes were softer, soggier, etc. Because the cake itself has sugar in it but then also relies on the glaze, I’d be able to tell if the substitutes had any aftertaste in the glaze compared to what’s more disguised in the rest of the cake. Baking the cake in a loaf pan would make it easier to tell at a glance if there was any appreciable difference in rise. Thus I set out to make three cakes today, carefully controlling all other ingredients and factors as much as possible for a true comparison. I used eggs from the same container, butter all from the same source and freshness, all cooked in the same pan in the same oven in sequence, and I was careful to not let any batters sit longer than any others. I even made sure they all had exactly 10 minutes in the pan after coming out of the oven with the glaze on to see if there was any difference in absorption. Knowing that many recipes fail entirely if all sugar is replaced and that sugar substitute makers often recommend only replacing part of the sugar, I made the first cake with full sugar, the second with half sugar and half Splenda Granulated (including the glaze), and the third with half sugar and half Pyure Organic Stevia (including the glaze). I noted that although the Splenda Granulated is made to measure like sugar, the Pyure Organic Stevia is twice as sweet, so I adjusted the measurements accordingly. 1) Preheat oven to 325°F/162°C (although because my UK kitchen only has a fan-forced (aka convection) oven I lowered this to 150°C). 2) Mix the sugar (and sugar substitute if applicable) with the butter until as smooth as possible. 3) Add the eggs and tablespoon of butter, beat together until completely mixed. 4) Add salt, flower, and baking powder. Mix well, breaking up any lumps, until it forms a smooth, thick putty-like dough. 5) Add milk and fold in until combined, then beat lightly until smooth. 6) Bake in parchment-lined pan for 1 hour. 1) Mix 1/3 cup lemon juice and sugar (plus substitute if applicable). 2) When the cake comes out of the oven, leave it in the pan and poke holes all over the top with a toothpick. Drizzle the glaze all over and allow to sit for ten minutes in the pan. Then remove using the parchment paper to lift the whole thing out and set it on a plate to cool and continue to absorb the glaze. You can serve this cake warm, but since it took hours to bake all three, I wanted to ensure they were all at room temperature for the taste test. I took several photos as shown below and then cut interior sticks out of slices for my husband and older daughter to test. Anyway, I put those slices on a paper towel on a plate labelled as 1, 2, and 3 in order as above, because they didn’t know what order I’d used for baking. This way it was as close to a blind taste test as possible. I also taste-tested but since I knew which was which, my results may be skewed by that knowledge. As the cakes came out of the oven I took photos of the tops before putting on the glaze. Or at least I meant to, and forgot with 3 until after I’d just put the glaze on. Either way, it’s pretty clear that the sugar and Stevia both produced a nice browned top but the Splenda came out kind of pasty. Splenda’s own website acknowledges this and suggests spritzing the tops of batter with oil to promote browning but I didn’t do that here since I was doing a straight comparison. Cake 1 was nicely browned. Cake 2, the Splenda cake, had a very pale top. Cake 3, the Pyure Organic Stevia cake, was almost as brown as the full sugar cake although the edges weren’t quite as crisp. In mixing the glaze, I had hoped the sugar substitutes would dissolve more in the lemon juice than the regular sugar since they have less heft to them. No matter how much I mixed the sugar, the end of the glaze came out in a sludgy lump that sat unevenly on the top of the cake. The Splenda foamed (which always happens when you add it to liquid because it’s aerated) and got surprisingly sludgy as well, but then it was absorbed into the cake more evenly. The Pyure Organic Stevia didn’t foam but it also got surprisingly sludgy and lumped onto the top as much as the sugar. 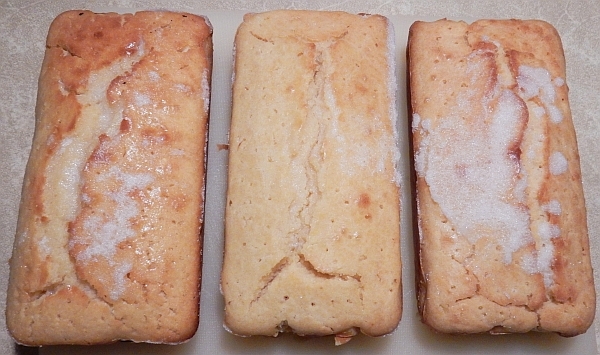 Cakes 1, 2, and 3 left to right with glaze on. Cakes 1, 2, and 3 left to right. 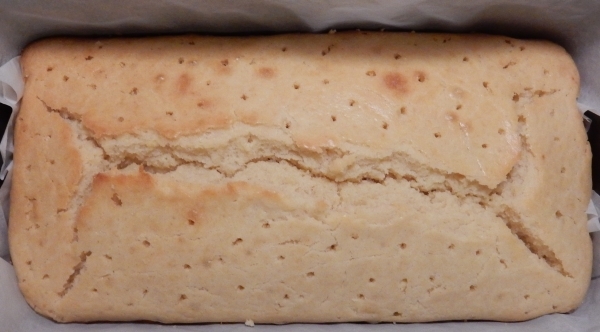 Cake 1 – the full sugar cake – is noticeably higher than the two with sugar substitutes. 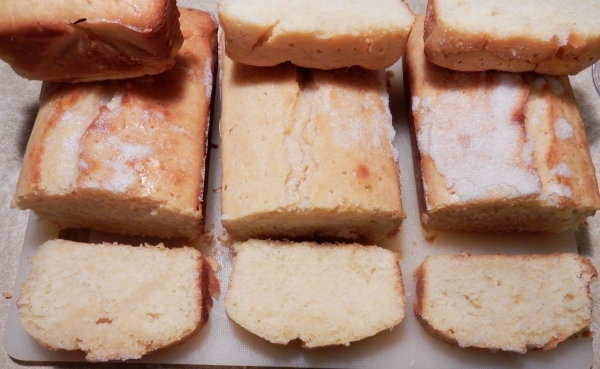 For the taste test, I cut off the ends – which is when I noticed that the full sugar cake was noticeably crispier on the brown edges than the other two, even including the Stevia’s equally browned edges – and then cut the same size slice off of each. The interiors look mostly the same except for a bit of a doughy or wet streak through Cake 1. It’s hard to tell if that’s an underdone bit or if the glaze seeped through a crack more thickly in that spot. I then cut each of those slices from top to bottom into fifths so I could present two more-or-less equivalent interior slices to my husband and daughter. My husband preferred the Pyure Organic Stevia cake overall because he detected an aftertaste with the Splenda cake and found the full sugar cake to be doughy. My nine-year-old preferred the Splenda cake overall because she also detected an aftertaste but liked it. She said she detected one in the Stevia cake too but wasn’t as keen on its texture. 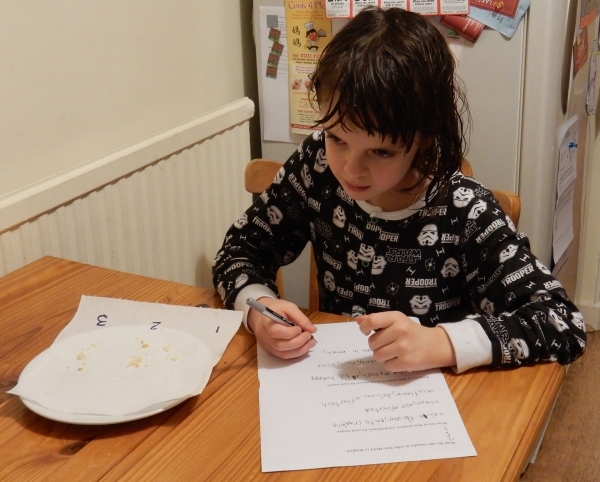 Peo evaluating the cakes in her awesome new Storm Trooper jammies. As always, she has a very rough life. I sampled each as well and at first could not honestly tell the difference, which surprised me since I was expecting an aftertaste from the sugar substitutes. 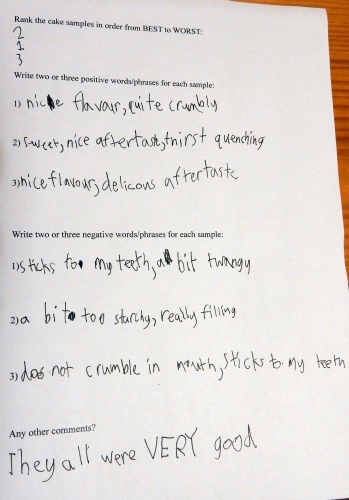 Upon further sampling I could sort of taste a bit of an aftertaste with the Splenda, but nothing overt. I detected no aftertaste at all with the Stevia. Texture-wise I liked the full sugar cake best because it was moist but had a good crumb, whereas I found the Splenda cake slightly spongey and the Stevia cake very spongey. And as mentioned above, the full sugar had a better overall browning and crispness to that browning, but having made this cake with just sugar before, I know that crispness will be gone tomorrow because of sealing it in a plastic tub, so that really only counts if the cake is going to be served fresh out of the oven. 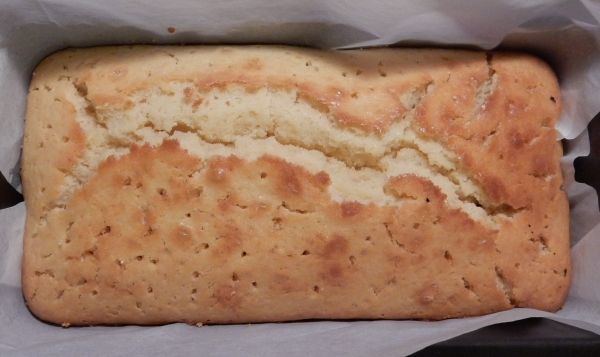 Thus my overall conclusion is that if you need to reduce sugar intake, both Splenda Granulated and Pyure Organic Stevia work very well to replace half of the sugar in a strongly-flavoured lemon cake such as this. Expect a bit less browning and a slight aftertaste from Splenda, plus slight texture differences from both substitutes, but if you’re only substituting part of the sugar the result should still be pretty good. The Pyure Stevia is organic so if you prefer to purchase organic products, it has that edge, and it does brown more than the Splenda. Applications in other recipes may vary, so I encourage those seeking to reduce sugar to try both of these and see what works best for you. I’m not in the US right now to be able to price-compare, but if you’re doing so remember that the Pyure is twice as sweet per volume as the Splenda, so it will go twice as far in recipes and you’ll need to calculate price comparisons accordingly. I know some folks don’t like sugar substitutes in part because of a lot of misinformation online about supposed links to cancer due to the saccharin scare in the 1970s. But as recently posted by the Mayo Clinic – international leaders in cancer research – modern sugar substitutes are not linked to cancer and while they shouldn’t be consumed by the bucket load in a faux healthwashing scheme, they are of benefit to diabetics when they are used to reduce overall actual sugar. So while you should probably let your recipients know if you use a sugar substitute because it’s always best to make everyone aware of all of your ingredients in a general sense to avoid allergies and other issues, both Splenda Granulated and Pyure Organic Stevia are entirely safe to eat. If your friends decide they don’t want to eat it because they’re misinformed, that’s more lemon cake for you! This entry was posted in Links, Other People's Recipes, Products. Bookmark the permalink. Hi Kimberly, I loved this article! 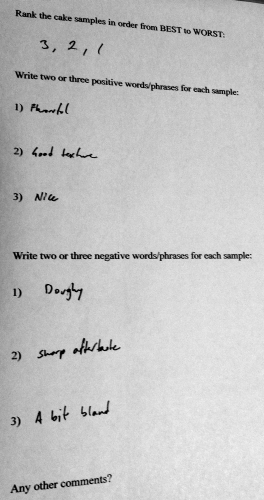 Glad to know the Stevia was successful – I like the idea that it browns nicely. Not sure what you mean by "spongy". Like the softness of a box-mix cupcake? Not as firm as a pound cake? Never have been a fan of Splenda in baking so this will give me something else to try. Thanks for your hard work and how well you did the comparisons to keep all things as equal as possible. Big hugs to you and your family. Like it had a bouncy, chewiness to it. Not like gum or anything, just noticeably more than the full sugar version. Glad you liked the article! It definitely gives you options for your brides! I never bake with the Splenda granulated. It's crap for that, IMHO. I use the Splenda Sugar Blend. To me it's the best of both worlds.